I’m not very interested in using photography in some of it’s more common forms – to explain, document or reveal. Rather I’d rather put it to work in the service of mystery. Mystery arouses curiosity and speculation, which allows for a greater range of meaning. In fact, since photography is so well suited to literal description, the use of ambiguity can be even more compelling. Perhaps an apt analogy is between a documentary film and film which is fiction. While good documentaries can be fascinating, they usually don’t involve the viewers imagination and emotion in as complex a fashion. Documentary film and photography brings you face to face with reality – the impact of that reality can be powerful. But non-documentary film and photography invite you to create your own reality, make up your own story. 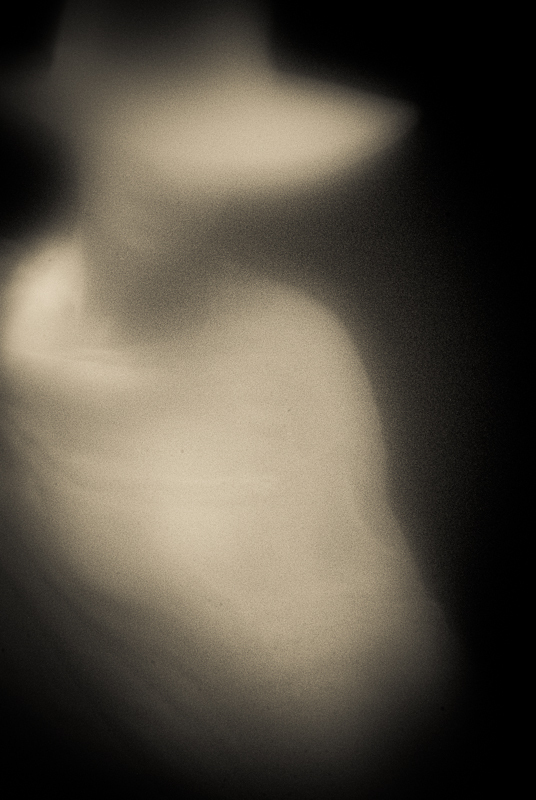 This entry was posted in abstract photography, BW Photography, creative process, Figurative, lensbaby, Nudes, photography. Bookmark the permalink. Wonderful image! And love your quote.. Please let me know that you have visited my blog and tell me what you think: click on "Comments" under any post's title to leave a comment. All images are © Bob Cornelis unless otherwise attributed.